So many people have the BSR (Bernina Stitch Regulator) – and for good reason…this free-motion “foot” is incredible. But…so many our so nervous about even trying it, that it remains tucked away in it’s cute little tin box. Time to open that box and start stitching!! 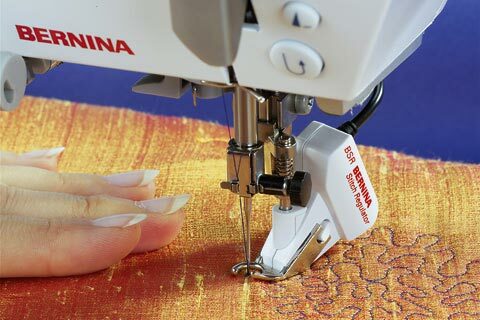 These classes were designed to help you become COMFORTABLE with free-motion stitching. You’ll be amazed at the incredible results you’ll get! In the first class, you’ll be stitching cables and feathers…and I’ll bet you’ll even be able to write your name in stitches! For anyone in the Palos Heights, IL area…I will be teaching my popular BSR classes in July @ Susan Marie’s quilt shop. Become more comfortable with your BSR – it’s fun! We’ll start with the basics of machine quilting, including discussion of supplies, notions, threads, batting, design marking, etc. You’ll have plenty of time to practice and get comfortable before jumping into feathers, cables, motif designs, as well as stipple quilting and free motion. There will be a lot of in class practice before you start on a whole cloth wall hanging project. You” be amazed at the results you can obtain with the BSR! This is a PREREQUISITE to Skill Building (2nd in Series).